One in three parents are completely confused by their children’s homework. 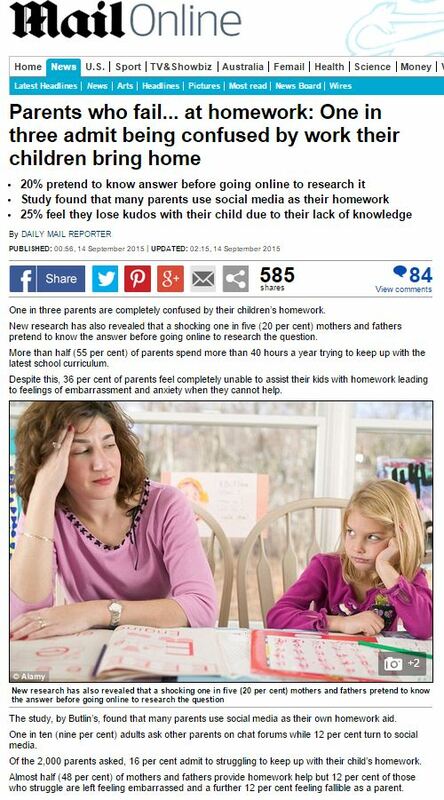 New research has also revealed that a shocking one in five (20 per cent) mothers and fathers pretend to know the answer before going online to research the question. More than half (55 per cent) of parents spend more than 40 hours a year trying to keep up with the latest school curriculum. Despite this, 36 per cent of parents feel completely unable to assist their kids with homework leading to feelings of embarrassment and anxiety when they cannot help. Children’s homework is getting more and more complicated, we’re led to believe, and parents these days simply can’t keep up… according to who? The study, by Butlin’s, found that many parents use social media as their own homework aid. Butlin’s has launched an ‘Astonishing Family Science Weekend’, a new initiative at its resort in Minehead to help children and parents grasp some of the trickier school subjects. While it’s doubtlessly commendable that Butlin’s want to encourage more children to embrace the wonders and excitement of learning and science, it’s a shame to see them do it in a way which so clearly denigrates the intellectual capabilities of parents. This entry was posted in Butlins and tagged Butlins, daily mail, daily mail reporter, Jason Fitzpatrick on October 15, 2015 by Michael Marshall.